This last weekend, Blood-C: The Last Dark was released in select theaters across Japan. This movie is the conclusion to the story-arc started in the 2011 anime Blood-C. It is also the latest in the Blood series—which started with the feature film Blood: The Last Vampire (2000) and was continued in the anime series Blood+ (2006)—as well as several games, manga, and light novels. Blood-C is often panned for being so different in scope and tone from the previous incarnations of the series. But while it appears on the surface that The Last Dark is more a throwback to these past Blood iterations than a true continuation of Blood-C, it quickly becomes apparent that this movie is actually a different beast all together. wrong), the movie's vast scenes of exposition are nothing but boring—and reveal little to boot. Worse yet, several of the "action scenes" are based around hacking; so unless you get really excited by seeing characters pound wildly on their keyboards, the only thing you have to look forward to are Saya's three action scenes—which take up a mere 20% of the movie. the course of the series. But in The Last Dark, Saya finds herself in the middle of a lesbian love story. While I am not opposed to Saya having this sexual preference, the entire idea seems to come completely out of left field based on what has come before. Moreover, the other character in the relationship, Mana, has literally nothing in common with Saya other than the fact that they are both lonely. While many movie relationships—and real life ones, for that matter—have been built on less, this still stands out as an oddity in the film. It doesn't really take away from the quality of the film, but it doesn't really add anything either. In both film and anime, it can be hard to follow action scenes taking place in dark locations. Luckily, The Last Dark doesn't fall into this trap. The film remains beautiful both in and out of action scenes regardless of the dark color pallet. Unfortunately, this is almost completely ruined by a fight scene at the climax of the film where the monster is rendered as a 3D computer model, while Saya, the other monsters, and the background remain in classic 2D animation. This sudden clash of styles yanks the viewer out of the film and into a state of confusion. The Last Dark spends a good ten minutes of its running time in a crossover with fellow CLAMP series xxxHolic. The problem is—unlike the xxxHolic cameo of the series which was an integral part of the show's overall mystery—this one does nothing to further either the story of xxxHolic or The Last Dark and ends up being nothing but useless fan service. In fact, despite being nothing but useless fan service, it actually manages to hurt the lore of xxxHolic by breaking one of the key rules of that series. Coming out of The Last Dark, I had only one question, "Why?" Unfortunately, I had this question about almost everything in the movie. Saya is obviously out for revenge after the events of Blood-C, and Mana is trying to bring down the man responsible for the death of her father. But these are the only character motivations that are truly explained. The other heroes get one-line back stories—if they get any at all—and the villain's stated motivations make no sense whatsoever after the final reveal. So while I know what happened, I don't know why it happened nor why the characters reacted in the ways they did. This makes it impossible to make any kind of emotional connection with the story or characters. rich philanthropist who backs them). Their job is to locate the information Saya needs to find and kill the main villain. The problem is Mana is a better hacker than everyone else, making the whole team superfluous. In fact, several of the good guys do literally nothing helpful in the whole movie—not a single plot point centers on their existence. And as a team they blunder into a trap so obvious in its sheer convenience, it's hard not to feel the team's death would only increase the quality of the gene pool. Yet as stupid as the heroes are, the villains are worse. 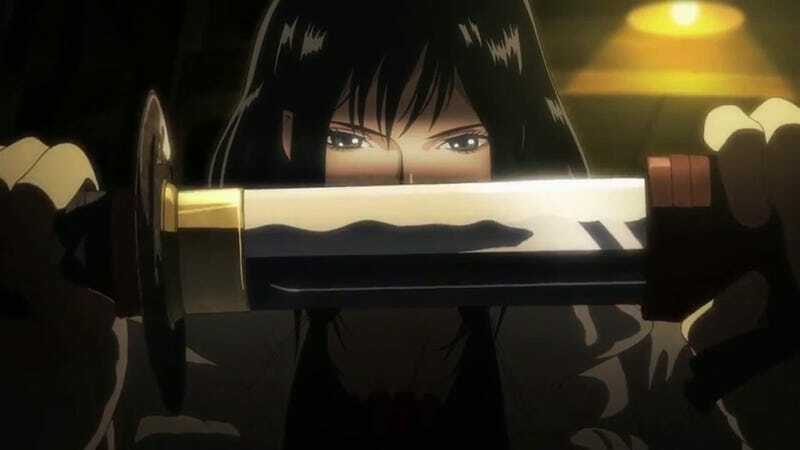 The key point of the movie is that Saya will not kill humans—yet is on a revenge quest to do just that. The movie centers on this internal conflict. Yet, the bad guys, after mocking her inability to kill humans, are happy to turn into monsters so that she can dispatch them without prejudice. There is no logic in their actions, only pure stupidity. Blood-C: The Last Dark was an incredible disappointment. The story was predictable, the characters unintelligent, and their motivations unexplained. The only redeemable part, the visuals, were ruined by laughably bad CG in the final act. And while The Last Dark may be more similar in tone and style to Blood: The Last Vampire and Blood+ than to Blood-C, that similarity is merely skin deep. In the end, perhaps it's best for all involved if Blood-C: The Last Dark is the last we'll hear of this incarnation of the Blood series.